What is meant by wet-in-wet when watercolor painting. I have just loaded my latest watercolor demonstration painting. The painting is titled “Rising Mist” and is of an early morning scene on San Diego harbor with the mist rising. It is based on a photo my wife took a number of years ago as she was sailing out of the harbor on the way down to Mexico. 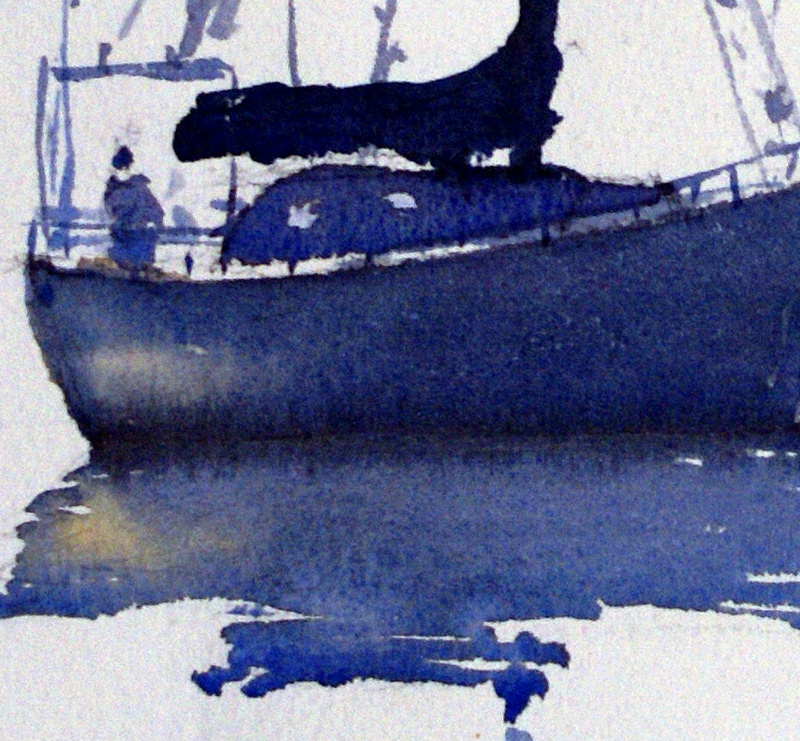 The demonstration takes you from the initial photographic inspiration, through how to draw boats and objects into the light, the initial wet on wet under wash, how to create a mist effect with watercolor paint, painting boat details and finishing with how to paint the reflections on the water. I hope you find it of interest and use! 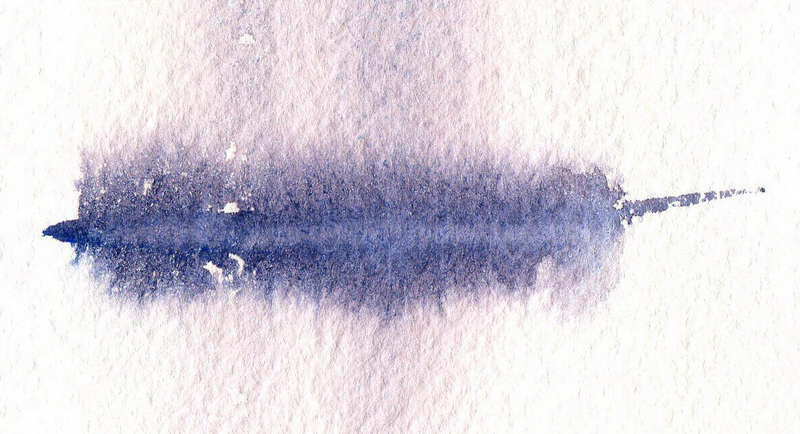 As the paper dries, during the wet on wet technique, it will arrive at a point where it has lost its shine, now if at this stage you run the point of your brush across this damp section of paper you will see an interesting effect as shown in figure two. As the paper is no longer very wet, at this point it will actually have less water on it than is on your brush. 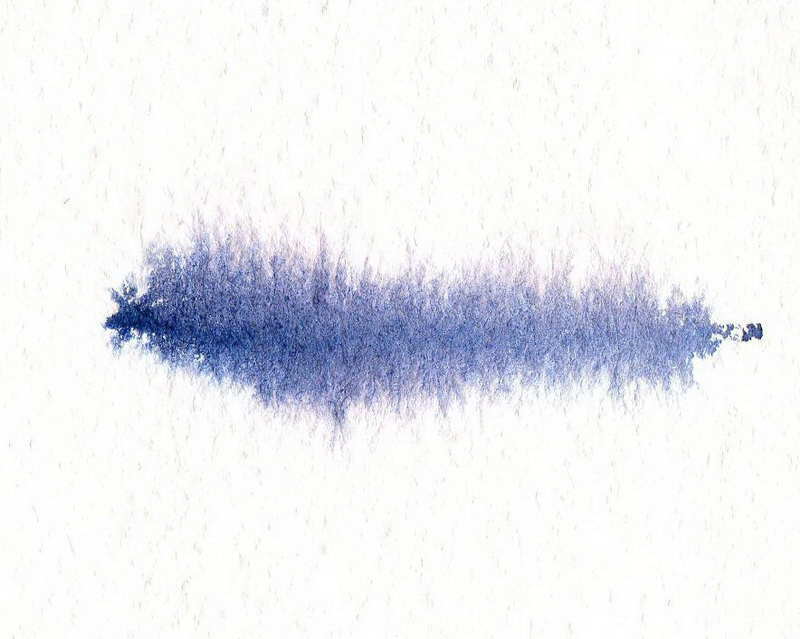 Now what happens is that instead of the watercolor paint just running down the paper, some of it is actually sucked up into the dryer section of the paper – so you can get a whole range of soft to furry effects both up and down from the position of your brush stroke. I use this edge in many places within my watercolor paintings. 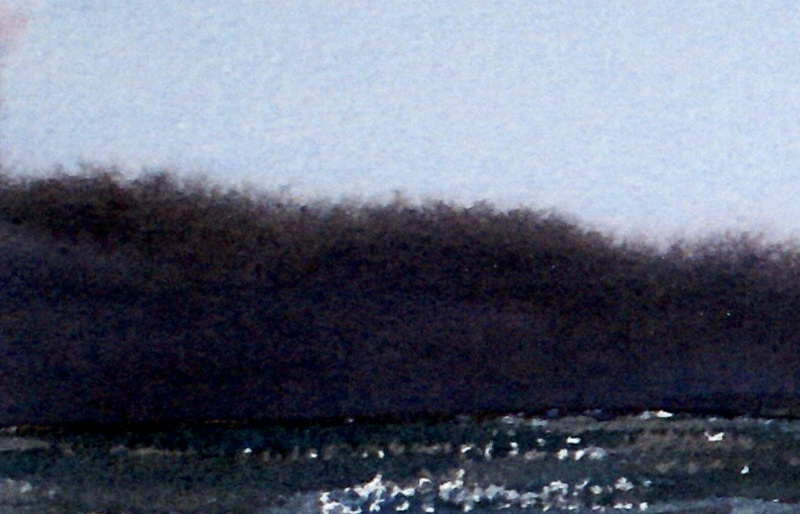 This is a great edge I use for creating soft connections of a boat’s hull with the water so it looks like it is floating, I use it when creating certain shadow shapes, for quickly creating trees and reflections on a distant lake shore and I also use it in my watercolor landscape paintings to create a tree line on top of a hill. Its uses are almost endless! When painting with watercolor you need to take advantage of this interaction of water,watercolor paint and gavity, to create the effects you would like to produce. This is one of the most difficult of edges to conquer as so much depends on timing (how wet is your water color painting), how wet is your watercolor mixture in your pallet and brush, the anble of your board as well as how fast it is all drying; environmental conditions greatly affect your painting and you must be aware of them. When painting watercolor landscapes plein air environmental conditions are even more critical! We will now look at the wet on wet watercolor painting technique. A good exercise to understand the potential of using wet on wet techniques is to mix a milk strength mixture of French Ultramarine and Alizarin Crimson. Then tape a quarter sheet of rough textured watercolor paper to your board. Then with a round brush, about a size 16, and your board titled to about 25 degrees, wet the sheet down one side. Use lots of water so there is a shine on the paper. Now straight away pick up a brush of the pre-mixed watercolor and paint a wide strip across the top of the wet part of the paper about 2 inches from the top. The watercolor immediately starts to run down the page. Now as you watch this you will notice a number of things. First, the water above the brush stroke you placed on the wet portion of the paper, flows down and gives you a very light soft (indistinct) edge as it washes the watercolor down from the point it was first placed. Secondly you will notice that the watercolor continues to flow and change shape as you watch it, in this way you are letting the watercolor help you paint your painting. Once it creates the particular shape you are after (i.e. when it has flowed far enough down your watercolor paper) you can lay the board down flat and it will stop flowing. Thirdly you should be able to notice that instead of just a single color appearing on the paper, as you had mixed it, the pigments have separated in parts. 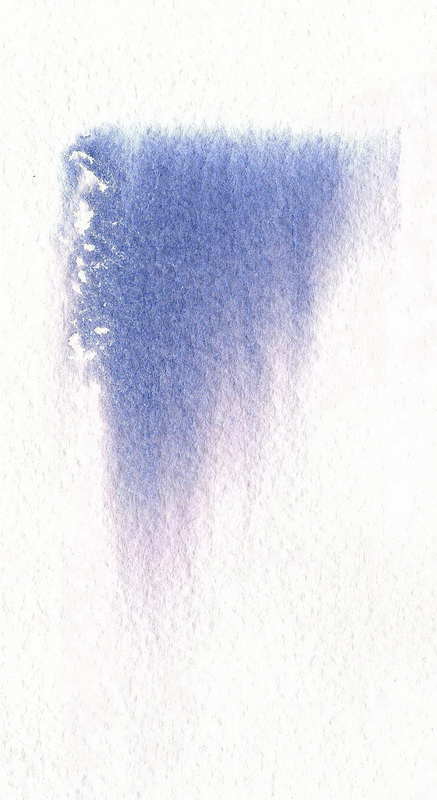 The French Ultramarine being more of a particle based watercolor will not flow as far as the Alizarin Crimson, which is more like a dye. So now you will see that the top part of this shape is slightly bluer than the bottom. This type of soft wet on wet or wet in wet edge is very good for giving the impression of rain, soft sunset clouds, and any other effect requiring indistinct shape transitions. Now obviously there are a number of factors which affect the result you will create with wet on wet techniques. Firstly how wet you wet the paper, secondly the angle of your board – the steeper the angle the quicker and further the watercolor paint will flow, thirdly how thick a mixture you mix with your paint – the more watery it is the further it will flow but also the lighter will be your result, and fourthly how much paint is on your brush. From practice and observation you will be able to better predict the general outcome of wet on wet techniques.